Photo by USF&WS A hatchling bird in the safety of its nest. For most of our birds, the nesting season is winding down. A few species, like Cedar Waxwing and American Goldfinch, are just now starting to think about nesting, but most birds have already finished with the work of ensuring a new generation of their species. The majority of our common backyard birds build the traditional “cup-shaped” nest that is tucked away in a shrub or the fork of a tree. Birds that build nests in such a fashion include everything from Blue-grey Gnatcatchers and Scarlet Tanagers to Indigo Buntings and American Goldfinches. Photo by Bryan Stevens A Red-bellied Woodpecker peeks from its nesting cavity. Other birds, such as Eastern Bluebirds and Tree Swallows, accept human-provided nesting boxes. In the past, however, these birds relied on natural cavities, such as a rotten knothole in a tree’s trunk or a weathered fence post that had gone hollow. The list of these cavity-nesting birds expands to also include Eastern Screech-owl and Great Crested Flycatcher as well as Carolina Chickadee and Tufted Titmouse. Most of the birds I have mentioned so far cannot excavate their own nesting cavities. Some birds, however, are better equipped than others at excavating nesting chambers in everything from tree trunks to river banks. Pileated Woodpeckers, Downy Woodpeckers, Belted Kingfishers and Northern Flickers create their own nesting cavities. Around the world, birds engage in a variety of nest-building strategies. Male Great Hornbills seal their mates into a nesting chamber until their eggs hatch. Cavity-nesting offers an added degree of protection compered to an exposed and vulnerable cup nest tucked in a hedge or dense shrub. Some birds have taken cavity-nesting practices to the extreme. For instance, the female Great Hornbill builds her nest in the hollow centers of large tree trunks, and the opening is sealed with a plaster made up mainly of mud, droppings and fruit pulp. She remains imprisoned in her nest until the chicks are semideveloped, relying on the male to bring her food. During this period the female undergoes a complete molt. The young squabs are devoid of feathers and appear very plump. She is fed by her mate through a slit in the seal. The clutch consists of one or two eggs she incubates for 38-40 days. Once the female emerges out of the nest, it is sealed again by the chicks. In some hornbill species, the young depart with their mother, and are tended outside of the former nesting cavity by both parents. 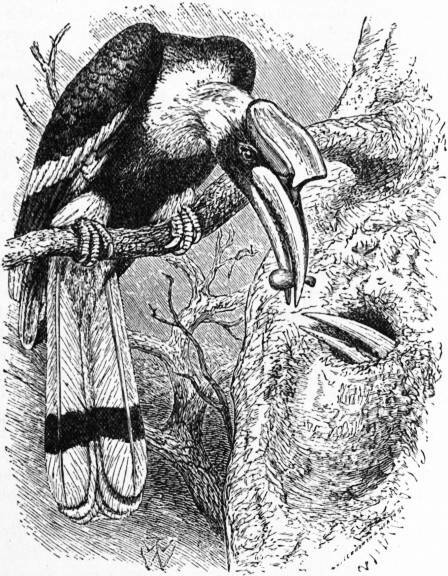 The Great Hornbill resides in the forests of India, the Malay Peninsula and Sumatra, Indonesia. There are about 55 species in the hornbill family, which ranges through Africa, Asia and some of the islands of Melanesia. Megapodes lay eggs in large mounds, trusting environmental temperatures to incubate them. Megapodes — also known as “incubator birds” or “moundbuilders” — do not incubate their eggs with their body heat as other birds do, but bury them. Their eggs are unique in having a large yolk, making up 50-70 percent of the weight of the egg. They are best known for building massive nest-mounds of decaying vegetation, which the male attends, adding or removing litter to regulate the internal heat while the eggs hatch. This method of incubation is something practiced by some reptiles, including crocodiles and alligators, but it is definitely unusual among birds. 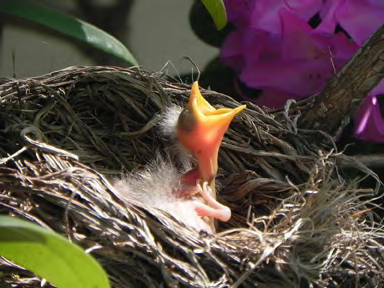 Once hatched, young birds are fully feathered and active, already able to fly and live without any care or assistance from their parents. 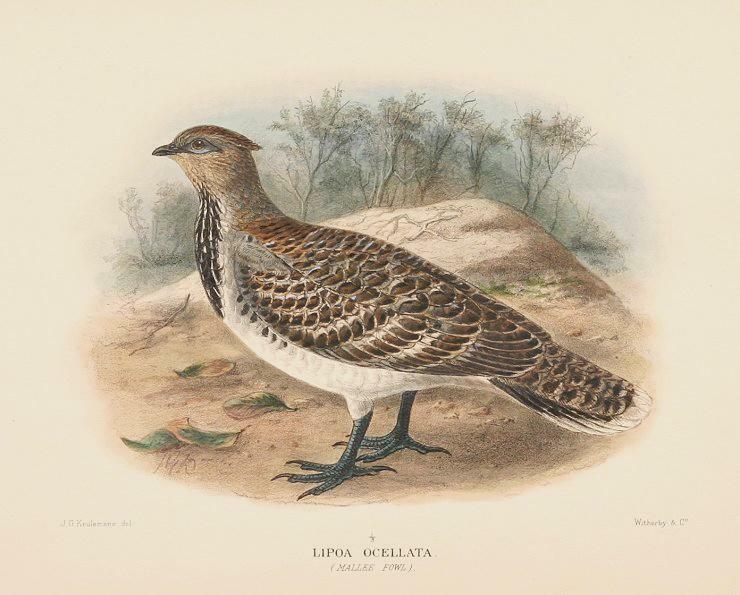 Two of the better-known species, both from Australia, are the Malleefowl and the Australian Brush-turkey. There are about 20 species of birds classified as Megapodes, and they are concentrated in the Australasian region, including islands in the western Pacific, Australia, New Guinea and the islands of Indonesia. They also occur on the Andaman and Nicobar Islands in the Bay of Bengal. Photo by USF&WS White Terns build no nest, merely laying their egg on a branch or, in this case, on a railing. The White Tern is a small seabird found across the tropical oceans of the world. 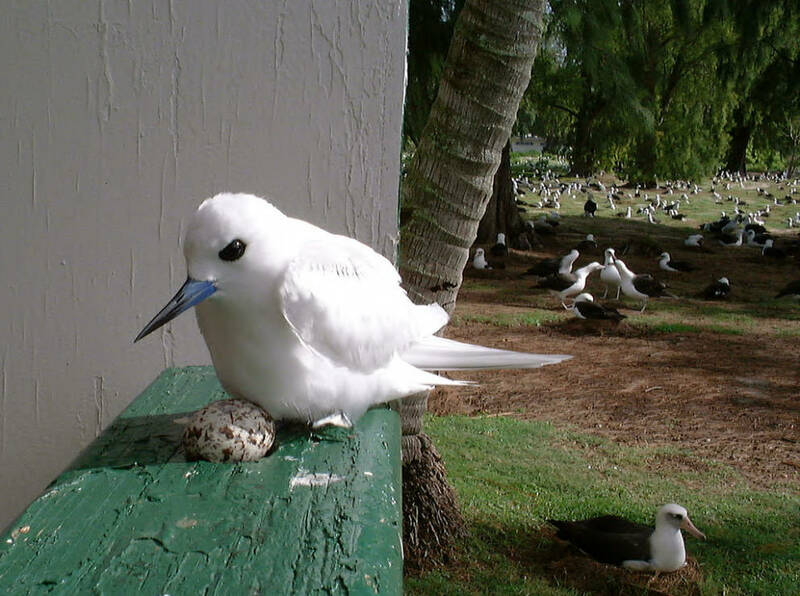 Although other terns build nests, the White Tern no longer bothers to construct even a rudimentary nest. Instead, the female lays a single egg on bare branches or in a small fork in a tree. Nothing else is added to the location where the egg is deposited. The behavior is not typical of other terns, which generally nest on the ground and construct the nest of such materials as shells and other seashore debris. Of course, both the eggs and chicks of White Terns are vulnerable to becoming dislodged by heavy winds. Newly-hatched chicks have well developed feet to hang on to their precarious nesting site with. 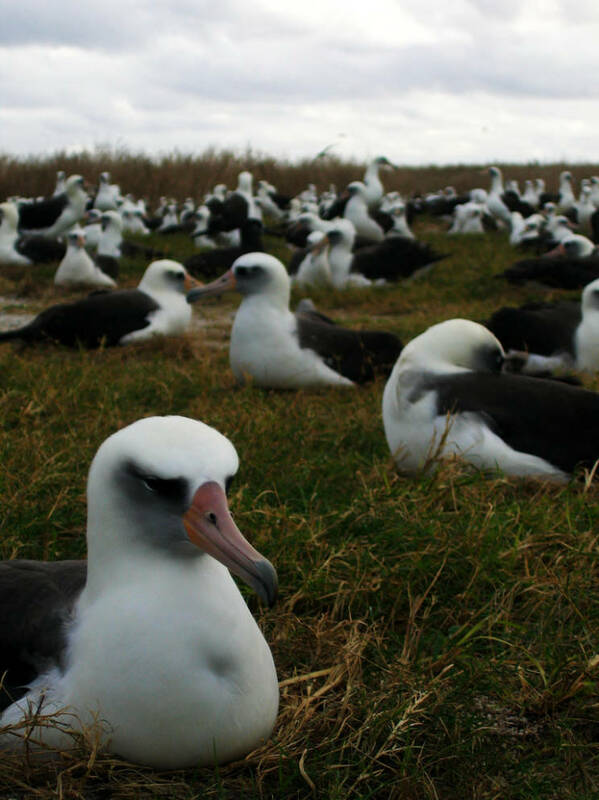 Photo by USF&WS Albatrosses, such as these Laysan Albatrosses, nest in communal colonies. Other birds, such as the Sociable Weaver, also nest in communal conditions. The sparrow-sized Sociable Weaver (Philetairus socius) of Africa enjoys company, which explains how such a small bird constructs a huge nest. Actually, many of these birds working together construct a huge structure — sometimes described as similar to a bale of hay — that hangs from sturdy trees and other tall structures. 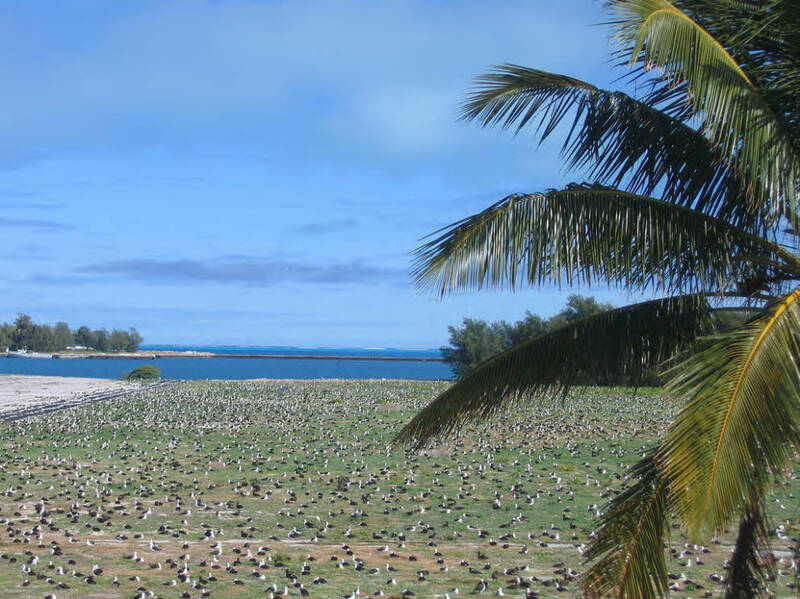 Such a “compound nest” is rather rare among birds. The communal nests built by Sociable Weavers can house 100 pairs of birds and are quite spectacular. They are also considered the largest bird-built structures in the world. Other birds also benefit from these huge structures, which are built mostly of grass and sticks. Other small birds may also nest or roost in the structure, and large birds, such as vultures, have been known to build their own nests on top of these compound nests. Other species of weavers also build communal nests, but their efforts are not quite as impressive as those constructed by the Sociable Weaver. Photo by USF&WS A colony of nesting albatrosses consists of individuals able to tolerate very defined senses of personal space. The most unusual nest I’ve observed personally was that of a Killdeer built in the parking lot of a local mobile home dealership. The Killdeer is a type of plover, a family of birds belonging to the group known as shorebirds. The female Killdeer will locate a shallow depression on the ground that can be lined with grass, weeds, bark, shells or rocks to form a crude nest. The Killdeer will apparently make use of any material readily available to line their nests. The particular Killdeer nesting in the gravel parking lot of the mobile home dealership had collected discarded cigarette butts to line her nest, which contained the usual four eggs. Her efforts are a testament to the ingenuity of some of our feathered friends. As far as I know, her nest succeeded, and she and her mate reared four young Killdeer. I always joke when telling this story that the young birds may have been born with a nicotine addiction. This entry was posted in Birding, Birds, Nesting birds and tagged Birding, birds, Bristol Herald Courier, Carter County Compass, Elizabethton Star, Erwin Record, Feathered Friends, McDowell News, Nesting birds, Our Fine Feathered Friends, The Erwin Record on August 2, 2015 by Bryan Stevens.